Home » Full Form , USSR Full Form » What is the Full form of USSR? What is the Full form of USSR? Q. What is the Full form of USSR? The Soviet Union (short for Union of Soviet Socialist Republics or USSR) was a single-party Marxist-Leninist state. It existed from 1922 until 1991 and was the first country to declare itself socialist and build towards a communist society. It was a union of 14 Soviet Socialist Republics and 1 Soviet Federative Socialist Republic (Russia). The Soviet Union was created after Vladimir Lenin led the overthrow of Alexander Kerensky. The communist government developed industry and over time became a major, powerful union. The largest country in the Union was Russia, and Kazakhstan was the second. The capital city of the Soviet Union was Moscow. Although technically countries could become independent if they wanted, in practice it was a completely centralized government, with no states' rights for the member countries. Many believe that the Soviet Union was the final stage of the Russian Empire; since the USSR covered most of the land of the former Empire. The Union was formed with the professed idea to give everyone equal social and economic rights. There was virtually no private property - everything belonged to the state. "Soviets", or workers' councils were created to speak for the workers and served as an elite group to govern them. It was successful in many fields; putting the first man and satellite into space and winning World War II alongside the United States and the United Kingdom. However, its centralized government found innovation and change difficult to handle. The union collapsed in 1991, partly due to the efforts at reform by its leader, Mikhail Gorbachev. 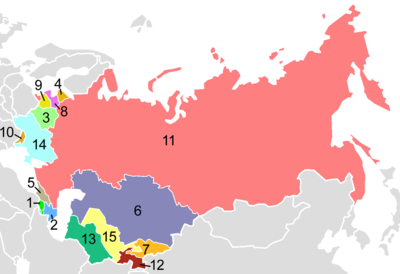 The Soviet Union was made of 15 republics. These were either Soviet Socialist Republics or Soviet Socialist Federal Republics. Each of these republics was independent. It also had the right to leave the union, which they did in 1991. The Federal Republics were different in that they had more autonomy, and were made up of states themselves. These were often called Autonomous Soviet Socialist Republics. There were a number of them. Most of them still exist; though they are now republics, within the independent state. The Tatar ASSR turned into the Republic of Tatarstan, for example (It is located around Kazan). Thanks for reading What is the Full form of USSR?